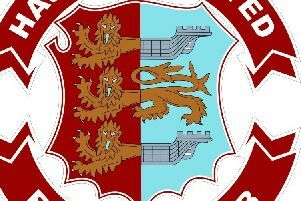 Hastings United are hoping to have another new signing in place as the football club finally returns to league action this weekend. Hastings manager Chris Agutter was optimistic of bringing in the right winger he spoke about last week in time for the trip to Guernsey on Sunday. Should the signing be completed, it will be the club’s second capture in around a week after left winger Youssuf Bamba, who made his debut in last weekend’s Buildbase FA Trophy defeat at home to Whyteleafe. The manager said last week that if two wide players joined the club, at least two would depart. “Players going out is something we’ve been looking at over the past two weeks,” he continued. “We’ve not made the final decision yet. * SUPPORTERS unable to travel to Guernsey can watch the game live on the big screen at the Hastings United Sports & Social Club. The bar will open at 12noon.